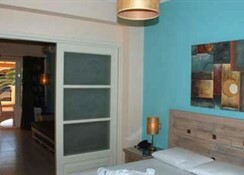 The apartments comprises of 2 individual buildings with a total of 18 accommodation units. 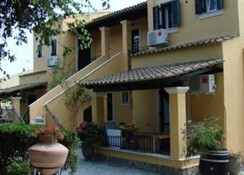 They are built in a typical Corfiot architectural style with neoclassical elements. They are surrounded by beautiful lush gardens. 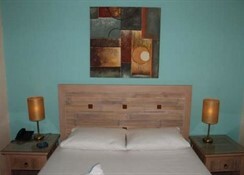 The hotel provides fully air-conditioned common areas, a restaurant and a TV room.The rooms are simply decorated with bright colours and exude a calm atmosphere. 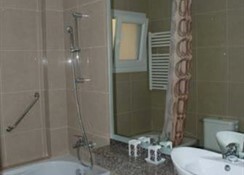 In addition to a private bathroom with a bathtub and hairdryer, they feature a direct dial telephone, TV, kitchen, fridge, double bed and a balcony. Individually regulated air conditioning units are a further standard feature. 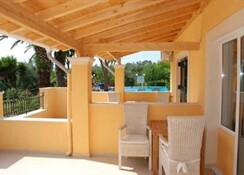 This aparthotel offers a large outdoor swimming pool and a playground for the younger guests of families.